In these tutorials, we are going to be looking at mesh analysis. 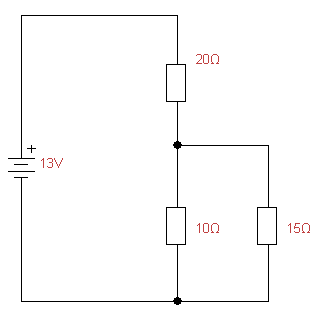 This is a circuit analysis technique which can easily be applied for analysing circuits comprised of a number of ‘loops’ or meshes. 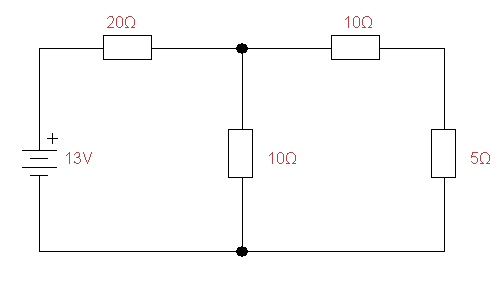 We will start with simple circuits, and then move on to more difficult ones in other parts. This is fine, but if we then wanted to know the current through the five Ohm resistor instead of the twenty Ohm, things get even more complicated! That’s where mesh analysis comes in. Mesh analysis relies on Kirchoff’s voltage law – that the voltages within a closed loop sum to zero. 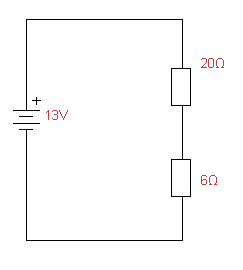 Using Ohm’s law we can now form equations for the sums of the voltages in the two meshes. We have -13V + (i1 x 20Ω) + (i1 x 10Ω) from the ten volt battery and from Ohm’s law as V = i x R. We also have another voltage, this time in the opposite direction from the other two which is caused by i2 (i2 x 10Ω).